I had the pleasure of interviewing Jane Mayer, a healer, poet, and ceremonialist who has studied with indigenous teachers in the mountains of Peru, the Amazon, and the highlands of Ireland, alongside those in the Western world. She works with plant medicine, sacred sound, somatic experiencing, dream work, and multidimensional healing to support individuals and communities in transmuting their grief and pain into pathways to embodied soul. She offers individual healing and ceremonies, as well as international retreats, and works with individuals and organizations to help them remember who they really are. About 10 years ago, I came to the end of the life I was living. I was a young woman in her mid-twenties, absolutely run by the darkness of unresolved trauma. Despite my intelligence and capacity, I found myself at the end of a long run of addiction, an eating disorder and an autoimmune disease. I had no more ideas of what to do — except to start the process of healing myself. I began to realize that no one else was ever going to do it for me. I started by getting sober, and then began a 10-year process of diving into a multitude of alternative healing modalities in order to heal myself. 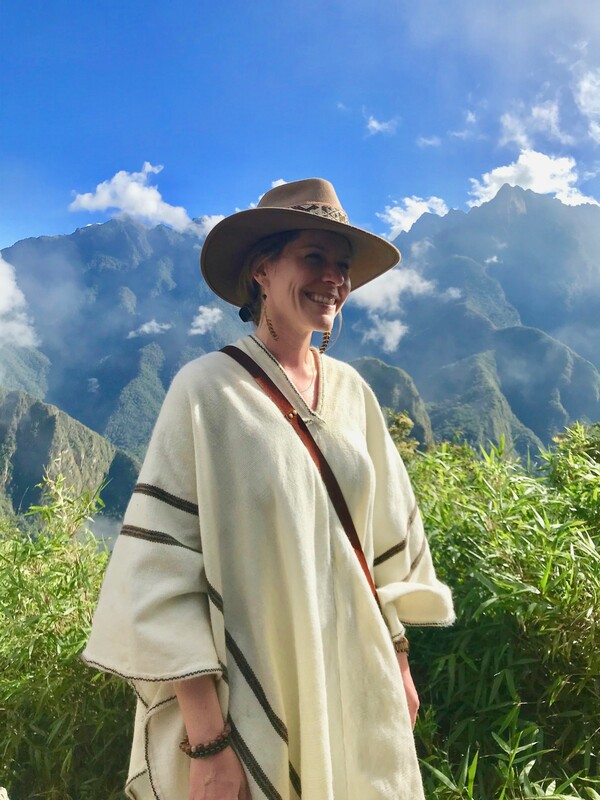 Eventually, I found myself in Peru, drinking the sacred plant medicine, Ayahuasca, and have continued to return again and again to learn from and heal with the plants of the Amazon jungle and the Andes Mountains. Along the way, I realized that I had been given so much — and the only right course of action was to begin sharing it with others. Every personal challenge that I overcome is an investment in the light and consciousness I can offer the world. I do offer guidance for anyone else around healing I have not yet done for myself — and so my highest priority continues to be healing myself — body, mind and spirit. And then, what naturally arises from overcoming my own challenges, is that I have the capacity to help others to do the same. 1. Treat the whole person, not simply the disease. 2. Don’t assume pathology — listen for a deeper, more expansive reason behind symptoms. 3. Stay open to timelines and pathways for healing — avoid giving absolute outcomes and timelines. 4. Continuously empower patients to follow their bodies’ wisdom. 5. Encourage patients to strengthen the healthy parts of their body, mind and soul — it will help them grow the health in other parts of the body and remind the soul of its power and strength. I wish we all would be more transparent about who we are and how we have come to be the guides that we are. The only one who benefits from me not sharing my story is my ego — the part of me that wants you to think that I just magically became this person without any pain or shame or grief or hard work. If we truly mean to empower our clients, we need to share with them the struggles that we have faced. We need to let them see our humanity. We need to pull out these illusions of perfection — there is not one person on this Earth who hasn’t struggled in some way. And letting my clients know that I have BEEN THERE and have come out the other side gives them the strength and faith to know that they, too, can heal themselves. This IS the story of my life. I have woven (and am still weaving) a parachute out of everything inside me, in my ancestral line, in this world that is broken. And I’m learning to fly. (And you can, too). My movement would be for people to understand that given the proper tools and guidance, they can heal themselves. I want all of us to remember that WE are the ones who carry the power to heal ourselves and the world. The power was never (and still isn’t) outside ourselves. It is hidden deep inside us. We are the healers. We are the doctors. We are the creators.